Everybody craves for a beautiful home. And, an interior designer is an integral part of the beautiful home story. If you want to get started with an interior design for the renovation of your home or office, here’s the list of top 10 interior designers in Chennai who can help you make complete your dream of a perfect home. Do My Home started with a clear objective of solving the hassles experienced by home buyers right from the time the key is received from builder to completion of all interior works. Services: They offer a wide range of solutions right from Wood work, Electrical fittings, Curtains, Bathroom accessories, Painting, False ceiling to Decorative flooring, equipped with a state-of-the-art factory & highly-skilled manpower. 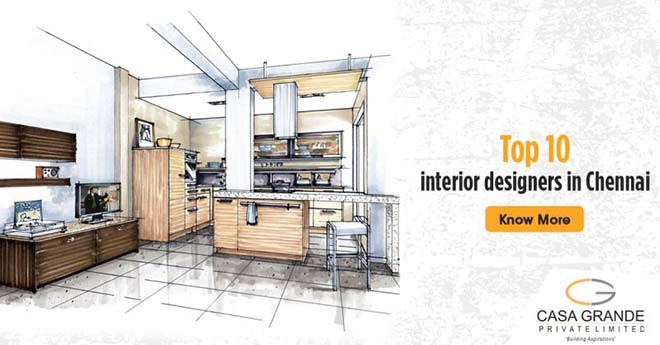 DEEJOS Interiors is a pioneers in rendering best Interior solutions for both residence and commercials. They can make your dreams come true through their creativity and innovation. Services: Interiors, Exteriors, site visit, space planning, furniture layout, 3D room views, 3D elevation, 2D detailed drawing, electrical & plumbing drawings etc. Connect with them: No.1, 1st Floor, CLC Works Road, Chromepet, Chennai-600 044. Zenith Interiors is a pioneer in rendering Home Interiors and Home Renovation services for your homes for more than 20 years. They provide interior designing and execution services in and around Chennai, in some of the most renowned cities in Tamil Nadu and other South Indian metros. Connect with them: Old #11/2, New #21/2, 5th Cross Street, IInd Main Road, C.I.T.Colony, Mylapore, Chennai-600 004. Orange interior is one of the Leading Interior Designing Company that has challenged the conventional way of thinking and thus given new dimensions to interior designing in Chennai. Specialized in designing and building both residential and commercial projects and delivering a unique blend of comfort and beauty. Reach out to them: # No : 25, Church Road, Perungudi, Chennai – 600 096. De Square Designers is an interior company which hold a record in the best customer services and customer relation In in Chennai whose main aim is to create world-class homes, offices, restaurant , banks, spas, and hospitals for its clients by developing interior designs and civil. Services: Interiors, Exteriors, turnkey contractors (commercial, residence decorators, restaurants decorators), renovation work commercial (residence decorators), electrical work (decorators), civil construction (decorators). Shilpa Architects Planners Designers is an international, award-winning Architectural Design firm headquartered in India. The firm was founded in 1979 and is acclaimed for pioneering work in Environmentally and Socioeconomically sustainable design. Services: site identification / land acquisition, best use studies, feasibility analysis and architectural planning, infrastructure and building engineering design, concepts and scheme, statutory drawings working drawings, detail drawings, boq’s & rate analysis, comprehensive project management until completion of construction, design build services. DesignQube is a curated consortium of architects & interior designers. It is young, resourceful & globally educated team of design professionals which work with selective clients who appreciate the value of custom design. Services: Architecture, Interior Design, Masterplanning, Landscape Design, Art & Graphic Design. Contacts: 8/4, Rajendra Colony, Saligramam, Chennai 600093. OffCentered Architects and Interior Designers, Partnership firm of well qualified Architects Balasubramanian, Karthik Raju and Jerry Meshach established design practice in Chennai in 2007. Services: all aspects of Architectural Design including Planning, Project Management Space Programming and Interior Design. Aamphaa Projects is the leading trader and service provider our company has been able to provide quality interior decoration services for many of our customers in the city with our team of strong and experienced staff members. Services: interior designing services, residential remodeling services, residence interior services, apartments interior projects, residential interior projects. Sanskriti Interiors is a Chennai-based interior designing and decorating company specializing in turnkey projects for offices with design and decoration of interiors based on the customer’s requirements. Contacts: 34/33, Alamelumangapuram Road, Mylapore, Chennai – 600 004. Professional interior designers can make your home go from boring to beautiful. So, what are you waiting for? Whether you are a first time home buyer or an NRI investor, connect with an interior designer today and make your home a true paradise to live in.